In light of the recent articles on community popping up here and there, I’ve been thinking a lot about where we belong, as individuals and as a family. Growing up in the country sharing property with a young neighbor my sister, brother and I always had a friend to play with, but only her. We didn’t grow up in a neighborhood, with classmates living in other homes on the street, or other neighborhood kids to play with. We grew up knowing we ‘belonged’ there in scruffy clothes, climbing trees and log-rolling down the grass-covered hills without neighbors who could see us from their windows except when we climbed up the hill and played in the trees. I also grew up very shy. It took me a very long time to overcome my shyness, and mostly as a result of being thrown into situations where extraverts befriended me. Hanging around them I met more people and slowly became more comfortable with myself as a person. Making friends and having friends gave me a sense of belonging, like who I was mattered somehow. As adults this feeling of belonging differs in intensity depending on the person, the place…but as an adult watching my own children making friends, or finding their way to do so, it deeply reminds me of the (almost) pain I sometimes felt when faced with making friends and I hope and pray they find a sense of belonging like I did. As an adult I sometimes wonder where I belong now and how I can define the sense of belonging. 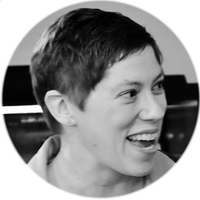 Is it just a feeling based on where and how I find myself fitting into a group, feeling comfortable around others doing the same as me – being a mom as part of a mom’s group, for example? A sense of community. …And I wonder how I can help my child always remember they will always find a place to belong here at home. Have you ever stepped back and thought about what it takes to learn something new? Some find trying new things to be very scary even as adults. Now think about that from a kids’ perspective. What sorts of emotions do they experience? Recently we bought a round swing, one that hangs from a rope attached to a branch. Both boys were very excited about it, but after one attempt at getting on, six year old Cutie Pie didn’t really want anything to do with it. Four year old Sweet Pea on the other hand jumped right on and started begging for us to give him a push. Then after his initial squealing was done requested to be swung higher and spun! It just was a little picture of him trying something new, a little glimpse I had into his mind. I know new things make me very nervous and many times I forget to stop and see new things from Cutie Pie’s mind and instead sometimes get frustrated with him for not jumping in and experiencing the fun. I’m reminded of this little swing scenario every time I walk into a store these days, surrounded by school supplies and back to school signs. While our kiddos might have gone to school before, the routine being slightly similar, there are enough new things happening in their lives that they might need us to step back and notice they are a little unsure, a little hesitant. As moms, stepping in with reassurance and love is definitely appreciated and desired! How do you help your child learn new things and begin new adventures? The little boy around the corner is 3 weeks older than Cutie Pie and they’ve known each other all their lives. They were even in Kindergarten together! Every once in a while he and his Mom come to her Mom’s house across the street from us and he stops to play. I always find it intriguing to watch the different dynamics while they play. Sweet Pea seems to love playing with T much more than Cutie Pie. They both seem more physical in their approach to play. Cutie Pie keeps wandering away, coming back to me. It doesn’t really seem like the need for reassurance, rather the acknowledgment that he doesn’t want to play the same way. This summer my eyes have been open to Cutie Pie’s acceptance of his interests being different than that of his friends many times. However, I’ve also seen him think about who has similar interests and ask for play dates around specific themes, like meeting at the museum or having LEGO camp for his friends. For now, I’ll just enjoy the neighborhood kids coming over unexpectedly and running around my backyard having fun with or without my boys (and their father!) being reassured not everyone is the same, but everyone can have fun! What things are your eyes being opened to while watching your kids play this summer? Last week it reached 95 degrees here, and the humidity was awful, making it feel more like 100. We have a small kiddie pool in the back, but sometimes that just is not enough to cool off. 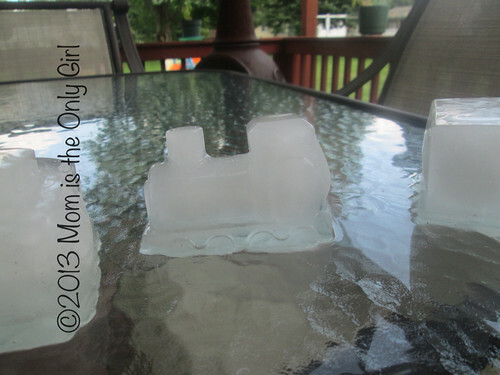 Four year old Sweet Pea had a good idea and asked me to make some ice for him using the train shaped cake mold I got for his birthday party last year. It was the perfect thing to pull out when the boys were getting tired of each other! 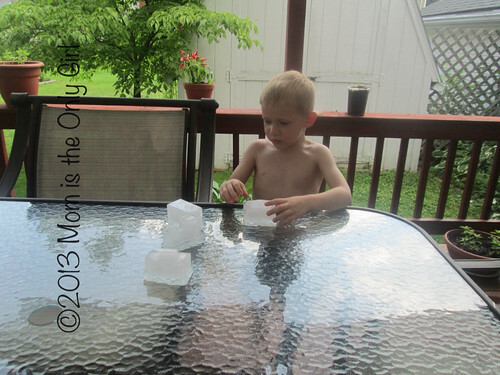 I simply popped the ice out on the table and Sweet Pea had a ball ‘driving’ his train around on the table, keeping cool as it melted while Cutie Pie had fun splashing in the pool and spraying me like I was a water gun target. I’m definitely going to do this again! We all love to spend a little time with family, right? This weekend we had the chance to visit with Hubby’s cousin and her family, whom he hasn’t seen for over 20 years largely because they live in California and we are in New York State! It was so fun for me getting to meet her after hearing all about her, and to meet her family was an added bonus! Of course the only photo my computer wants to share for me is the one with her hidden behind her daughter! Bonus of a walk we took together along the Erie Canal was getting to see the lift bridge go up in Fairport, NY. So cool! I’ll share more pics of that at another time. It is so neat to watch! 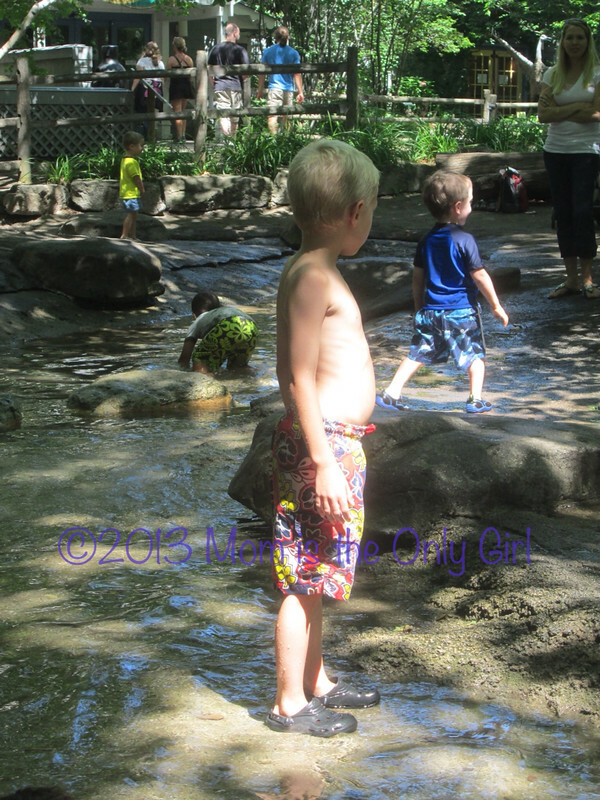 We’ve been spending a lot of time with our boys this summer…taking them to camps, having fun at the pool, playing with LEGOs, trips to see family…summer fun! I’ve been trying as often as I can to have the boys sit at the table and do a little “academic” work, we call it ‘table time’. For 6 year old Cutie Pie we’ve been doing things like writing a sentence, tracing words, creating specific objects with playdough…fine motor things basically. For 4 year old Sweet Pea we are doing things like coloring, tracing, attempting mazes, play dough play and pouring practice. The other day I found the lower case letter tiles I picked up a year or so ago. I quickly looked up a pin I remembered and printed out some word tile cards and laid them on the table. Cutie Pie really didn’t want to do table time that day because he had just gotten his LEGOs out, but he came anyway when I said it was something we hadn’t done before. I’m pleasantly surprised when Cutie Pie suggests doing things that to me are more ‘academic’ than I think he’s interested in doing! I only wish I could figure out when he’s in the mood for something like that so I can piggy back on it before it happens! We’ve had a lot of rain here lately and the boys were getting a little antsy. I pulled out the water and oil, taking a tip from Growing a Jeweled Rose, added some food coloring to the water and set it out along with a couple of medicine droppers. The boys, of course, were immediately drawn to it asking if it was for them! 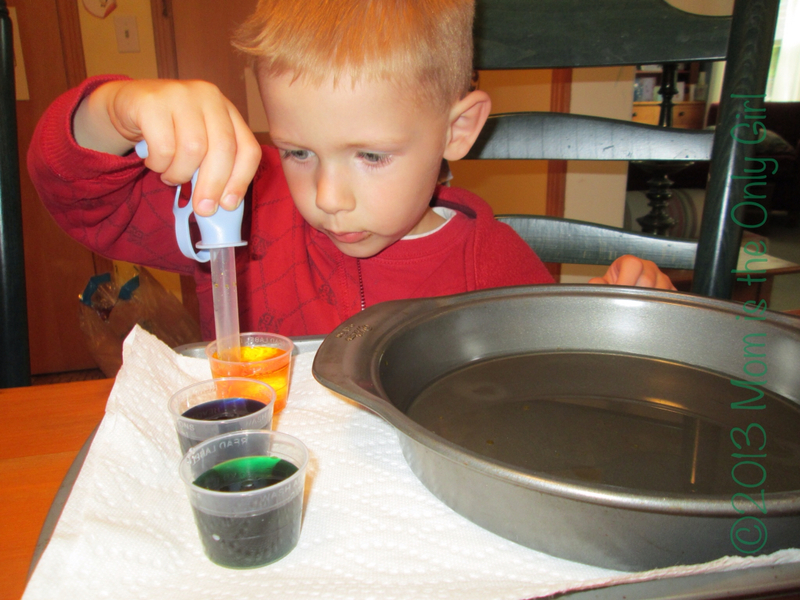 This is a great activity for fine motor pincer grasp work, learning/reviewing colors, science talk about liquids. It’s pretty self-explanatory what to do. 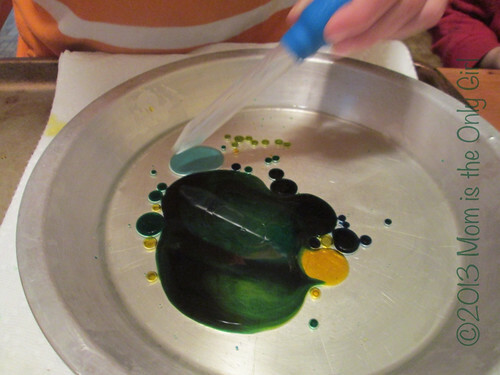 Pick up drops of colored water and drop them into the thin coat of oil (preferably in a dish with sides). Hint: I found medicine cups to be the perfect size for holding paints and water for their projects! What happens to the drops of color? Does it stay in little droplets? Why? What happens when you try to make two droplets into one? How do you do that? What happens to the color when they are mixed? I hope you have fun with this experiment! Tomorrow I’ll share with how we switched things up a bit the next time we pulled out the oil! Sweet Pea, my 4 year old, and I were playing with his lovies (stuffed animals) before bed last night. I love this one on one time, I never know what sort of conversation we’ll have before he decides to stop talking and fall asleep. He has several lovies and they are all different sizes, different species, different colors. In addition to counting them and talking about what letter each lovie’s name started with, we found ourselves comparing each to him and then to me. Before we said goodnight we had us all arranged (in sequence) from biggest (me) to littlest (his baby jaguar) and had talked about every way they were similar and different from each other and us. Baby jaguar was smaller than hippo, him and I. Hippo was smaller than him and I but bigger than baby jaguar and so on. I never really thought about how fun sequencing could be before saying goodnight to my little boy! How similar are the words? I used to doodle in my writing books as a little girl. When I noticed words sort of lining up one under the other I would tend to look for similar letters and draw lines between them. It was sort of like seek a word which is drawing circles around words formed within a chart of seemingly random letters. This activity consumed more of my time than actually reading. Hmmm, maybe that’s why I’m a slow reader? I showed this little similarity activity to 6 year old Cutie Pie one day, but he wasn’t impressed. I think it might have looked too much like a worksheet to him. I thought I’d share it with you, just in case this was something that your kiddo might like, but that you might not have thought of before! I started by simply making a list of our names on a sheet of paper, one below the other. I made the letters rather large. Of course, you can use whatever words you would like, but I kept my lists to about 4 or 5 words. Then we set out to discover the similarities – the same letters. We drew a line from one letter to the same letter in the next word. Very simple! But like I said, it appeared too much like a worksheet for Cutie Pie’s taste, but it might be just the right activity to capture your child’s interest or be something different to do in your homeschooling to reinforce letters of the alphabet. How often do your kiddos have to wait for something to happen? My dad and his girlfriend came out to visit this weekend and to my boys I think it felt like an eternity from the time they woke up until the car pulled in the driveway. I have to say, they played rather nicely while waiting, but for 4 year old Sweet Pea we could see it get increasingly harder for him to wait! Do you have a secret something you pull out when this happens with your kiddos? Please share! Did you wonder where I was for those few weeks? Even a little bit curious? Well, back in the beginning of March my knee began to be pretty painful to the point that I couldn’t work out or run and play with the kiddos due to the pain. I went to the Dr., was dutiful and went to PT twice a week for about 5 weeks, had my MRI and was found to have a small meniscal tear and was told my femur is rubbing against the (rough) underside of my patella. I’m not in pain now, thanks to a very painful cortisone shot – I did not respond well to it at first – but I’m at about 99% now and doing a lot of strength training which will hopefully do the trick to ‘undo’ the problem and avoid another cortisone shot! Anyway, the oddly positive thing about PT was getting the ice for 10 minutes at the end of each session. The first time I laid there wondering what to think about. Isn’t that crazy? I mean, when do I have time to just think outside of my own home, to let my mind wander to things other than what around me needs to be ‘done’?! I actually was wondering what to wonder about! I loved it, however, I realized I kept thinking about my kiddos and how quickly they have changed this past year. Time to think made me realize I needed to take time to just ‘be’ with my kiddos, drinking them in before they change too much. So there you have it. A gentle nudge to get that little pain you’ve been consistently experiencing checked out and a gentle reminder to sit back every once in a while and truly drink in the joy of your kids. They grow up so quickly! I decided to post this right after yesterday’s post of Balancing and Coordination Exercises, even though it’s not a suggested activity since it involves a lot of coordination and balance! Sweet Pea loves walking around with his lovies on his head. (I know, sounds silly, right?) When he first started this his lovies spent a lot of time on the floor. I was just noticing today they haven’t been down there that often lately! Have you ever thought about what goes into balancing something on your head? I mean, for a lot of us just walking a straight line is difficult! You’ve got to be holding your head steady (neck muscles) your back straight (core) your legs steady….so much gross motor control and so many muscles working together! At first Sweet Pea’s hands were held up by the side of his head ready to catch his precious animal. As he did this more often his arms lowered out to his sides, like he was walking a tightrope. You could see his coordination improving minute by minute, day by day. And his balance…he hardly wobbles from side to side, just practically runs along! I took my little break before realizing I never posted this. I am so sorry if you were following along every Monday, but here’s another post about Encouraging Writing (and sorry it’s on Tuesday this week)! Balancing and coordination activities help with early childhood writing abilities by way of the trickle down effect (gross motor enabling greater control of fine motor muscles), but they also can be just plain fun for kids! The suggested ‘exercises’ included in the OT packet I received to help Cutie Pie with his writing are great outdoor chalk activities, which we love! 1. Make several lines with chalk – straight, curvy, jagged. Practice walking forward on the lines keeping balanced. Then, walk sideways or backwards along the same lines! 2. Draw different shapes a few inches apart and practice jumping into the shapes. As this gets easier, draw the shapes farther apart, or jump sideways or backwards. 3. Play hopscotch! Practicing holding an adult’s hand may be needed at first! This is also sneaky number practice! Of course, to make this more challenging for your beginner reader you can use letters instead of shapes and numbers, similar to the Basketball Alphabet Game. These past several days I’ve found a longing into my heart to take a step back every once in a while and instead of writing about what we are doing, to actually enjoy the process of doing without having the thought of a blog post in the back of my head. So that’s exactly what I’ve been doing. Please excuse the short absence. I’m taking a short step back and enjoying my kiddos! Vision gross motor fun is pretty much typical play for seeing children, especially when it is play that takes coordination of their limbs to accomplish something fun. With the warmer weather finally arriving we’ve been playing outside more. One thing 6 year old Cutie Pie loves to do is pop bubbles. He will pop them with his fingers, punching at them, hitting them with a bat, squirting at them with a squirt gun, you name it! This is great at building coordination between his eyes and his arms and fingers. Another thing Cutie Pie loves to do is pour, although he doesn’t love it nearly as much as 4 year old Sweet Pea! Cutie Pie makes much less of a mess than Sweet Pea, which shows me his eye hand coordination is better and improving! 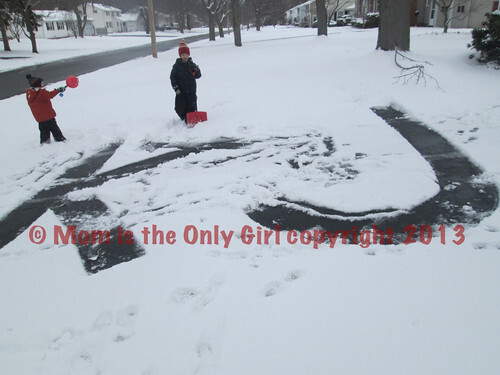 It’s another activity my boys love to do outside, where the mess isn’t even considered a mess! These are just a few of my kiddos’ favorites for you to try to help your child gain greater coordination, which will ultimately help with their writing. *Disclaimer: These ideas are not totally my own. I have been given some resources by the Occupational Therapists at my child’s school to help with his handwriting at home, unfortunately not all came with sources attached. I’m simply sharing these ideas in hopes that by seeing how they are helping my child they can help you or encourage you to seek help if you feel it is needed for your child. I have previously posted about fine-motor visual activities. These are activities that require coordination between the eyes and fingers in order to accomplish a fun task. OT has also suggested activities requiring coordination of the eyes and gross motor muscles as well. As we’ve all learned elsewhere, gross motor muscles are the first to develop and play a large role in developing fine movements. My kiddos love doing all of these, so it’s been very easy to incorporate gross-motor visual activities around here! Especially with the warmer weather it’ll be easy to include more activities like this in our daily routine. For the past several Mondays I’ve been posting about the materials/ideas sent home by the Occupational Therapists at 6 year old Cutie Pie’s school to help with his handwriting here at home. As you can tell a lot of these games increase coordination at the gross motor level, but all contribute to the overall coordination of a child’s body, including the finer movements like forming a pincer grasp. If you like this, you might want to check out other Encouraging Writing posts for more ideas! Cutie Pie and Hubby were having fun playing by making up a story together the other night. I think making up stories is a great way to encourage reading (it’s not really that far of a stretch), growing the imagination in all sorts of ways! Their story involved Hubby being a knight in a castle and needing to rescue a person trapped in a net being held in place by a friendly bear. Through a series of questions and actions Hubby had discovered the castle was surrounded by fields, but the bear was in a tree on the other side of the village. Hubby ultimately became a rescuer and was given a feast in exchange, however he had to obtain his own food! I love the way questions like where am I, what is around me, what am I’m trying to do and what am I looking at (among many others) can result in an intricately woven story as told by a 6 year old and his Daddy! What a great activity to have in your arsenal for long waits, car rides and any time you need a little distraction or imaginary play. Can’t you see this happening while playing with dolls or driving little cars around or building with LEGOs! I’d love to hear the adventures you and your child experience this way! 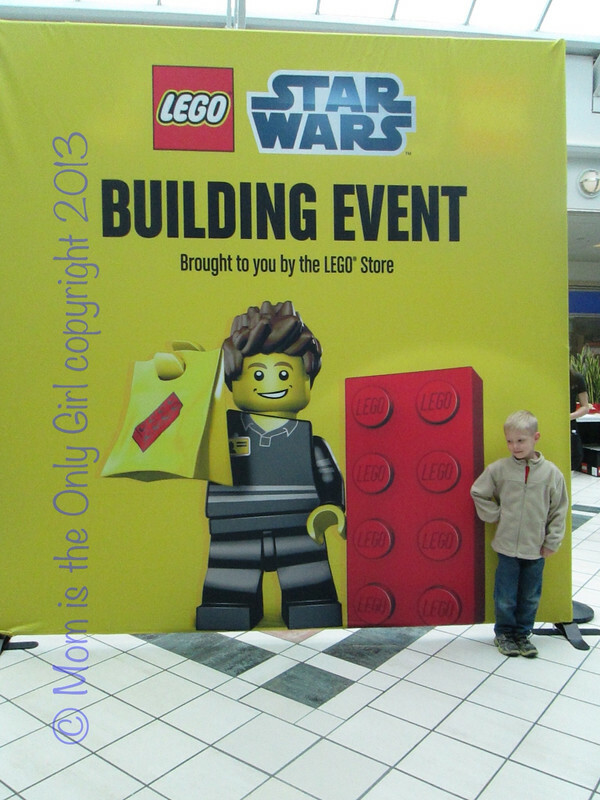 If you ever see a LEGO building event in your area, your kids would love it! To ease your frustration a little bit, though, you might want to consider taking them on a Friday! My 4 year old wasn’t as interested as 6 year old Cutie Pie. We set ourselves up at a table in front of bins of bricks and followed the instruction sheets before us. In exchange for their help the boys were rewarded with a certificate saying they helped. They were very excited! As I posted yesterday about the fine motor visual motor activities suggested by 6 year old Cutie Pie’s OT, today I’m sharing the fun ‘Vision Activities’ suggested. Cutie Pie’s favorites from this list are pouring water and flashlight tag (catching each others light circles) the best. The occupational therapist at Cutie Pie’s school sent home a summer kit meant to keep kiddos working on their OT and writing skills throughout the summer. These tools were meant to give me tools to work with him at home to improve his writing. He tends to hold the pencil with three fingers and his thumb, which seems to cause difficulty in forming letters and slows down his work pace, both of which will cause more difficulties when it comes to writing tasks in older grades. Each of these activities are focused on connecting what you are doing with your hands to what you are seeing. I think as adults we sometimes take for granted that everyone can do this easily. Kids really need to practice this eye-hand coordination, not just in a gross-motor way (like sports) but for writing as well. Counting. Recognizing numbers and colors. Each day after gymnastics class (posted about yesterday) Sweet Pea and another little boy would have fun at the pool table in the public game room at the recreation center. 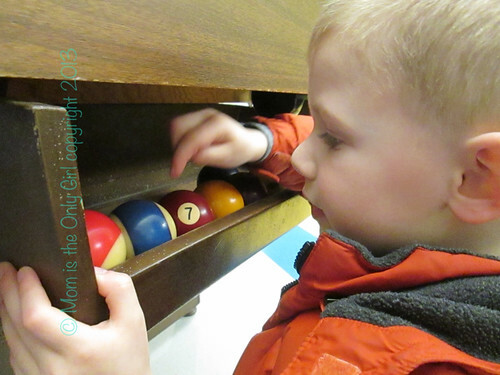 Only the pool balls were on the table, no cues, but the other mom and I still kept a close eye on the boys’ fingers. Playing with pool balls was really fun! Not only did the boys have fun simply rolling the balls trying to hit other balls and get them into the pockets (coordination) they also practiced number recognition! You can’t get much simpler than that! Another day when Sweet Pea and I were at the recreation center for another class we stopped in the game room and had fun with the pool table. This time I challenged him to tasks like rolling the blue and white ball to hit the yellow ball, or the 7 ball to hit the 3 ball. He had a blast, and for me just one playing at the table was a little more relaxing, although we still watched the fingers! 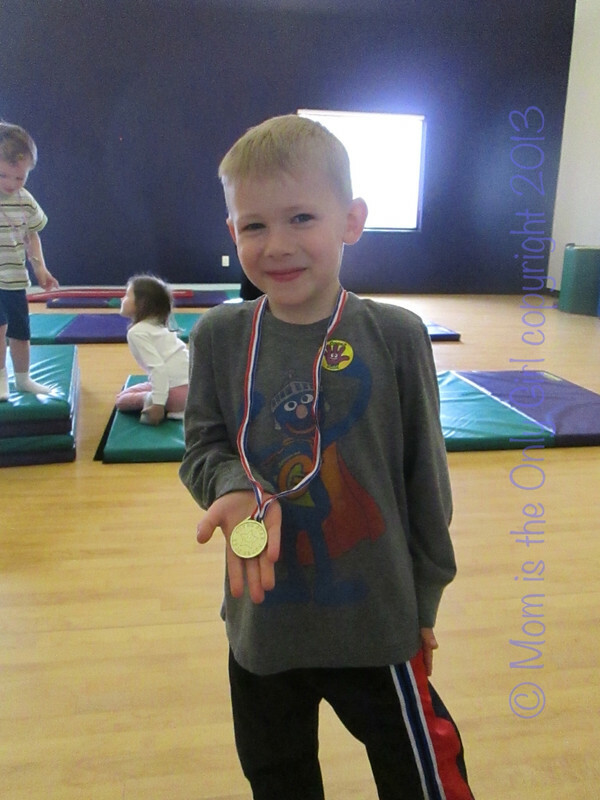 Sweet Pea took a group gymnastics lesson at a local gymnastics facility and absolutely loved it. However, it was a bit costly for this family. I found a short class through our local parks and recreation department, which just ended after 3 weeks and 4 year old Sweet Pea loved it so much I just had to share! He and the other children were expected to listen to the teacher and try everything she showed them. They learned why stretching is important for our bodies and learned simple stretches and other ‘warm up’ techniques that gymnasts use. They learned how to wait patiently in line. They learned how to show they are paying attention to their teacher when she clapped her hands. They learned to show specific movements as requested by their teacher in front of the group. 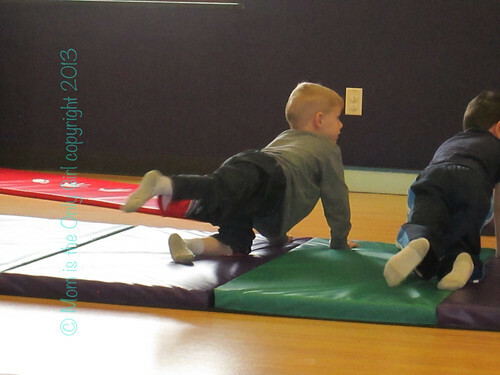 Most of all they were working on coordination, balance and other gross motor skills in a sneaky and very fun way! Over the past two weeks I’ve been posting about encouraging Cutie Pie to write as well as ways to help him get better at it. 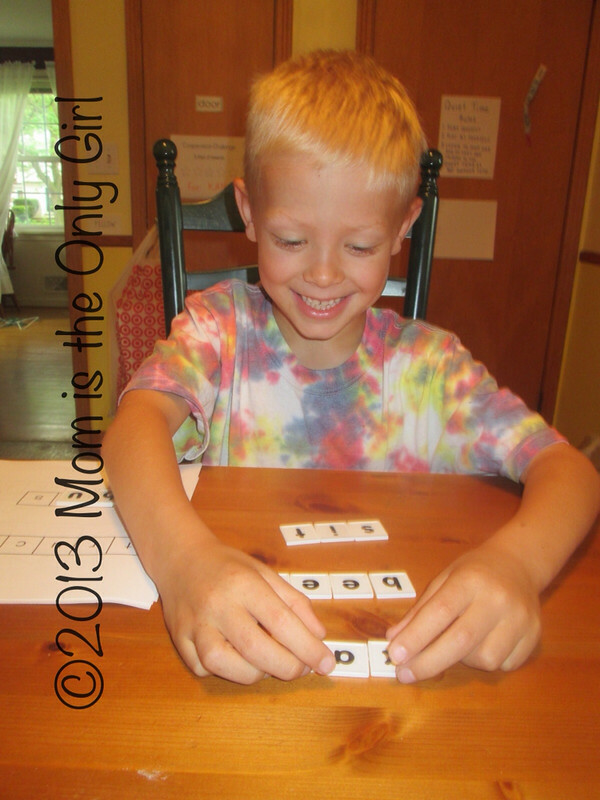 Today I’m sharing some ways he’s working on his fine motor skills, ways he doesn’t realize he’s learning and developing skills. Cutie Pie loves to draw, so we’ve been doing a lot of drawing on paper together, as well as coloring. We’ve gotten some How to Draw books out of the library, which Hubby and I have noticed have given Cutie Pie more confidence in drawing. This has seemed to help get him to draw even more than before, which helps (in theory) to get him using the pencil the correct way more often! We have also gotten him some dinosaur dot to dot books. Getting something he is interested in encourages him to actually complete them. The books we have also tell about the dinosaurs, so we get some reading in there, too. Cutie Pie loves to do mazes, whether on paper or on my iPad. Of course, dinosaur themed mazes catch his attention the most! There are some letter formation apps available for the iPad as well, but as I have stated before, Cutie Pie doesn’t seem to like learning using methods that appear as learning, and most of the letter forming apps we have found are of no interest to him. He does, however, love finding hidden objects, and so does Sweet Pea! I found a neat free app, called ABCMysteriez, which is all about finding letters in the picture. (As for most products, to get to higher levels you will have to purchase the full game, but my kids love what is available on the free app.) This reinforces letter recognition, too! I love sneaky learning! We started this whole endeavor with a strong interest in playing with stickers, so the first thing we did was get a dinosaur sticker book, called Dinosaurs, Sticker Encyclopedia (more than 600 stickers), which he loved and we could see that it definitely helped with his fine motor coordination! Now it’s your turn. 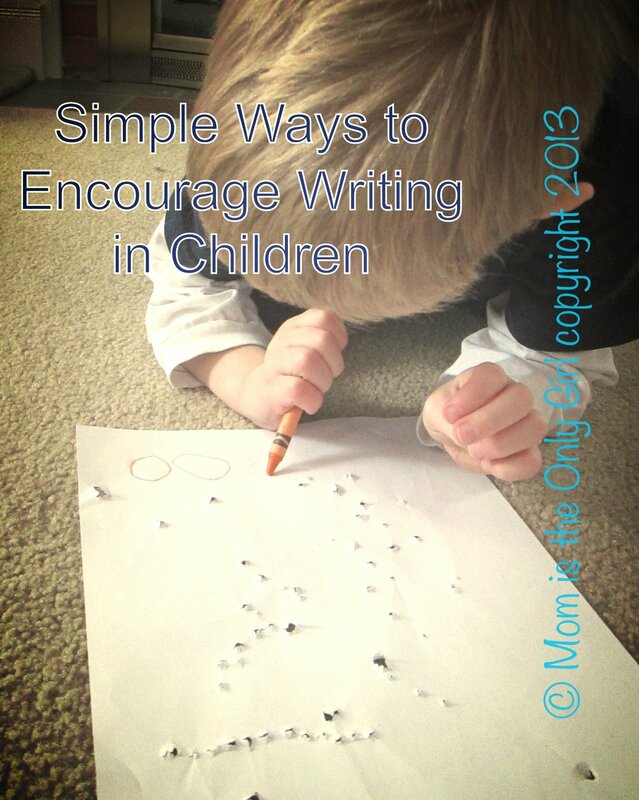 How do you encourage your kiddos to write? What fun ways are they gaining control over their fine motor skills? Last week I posted about Cutie Pie having a little difficulty with his writing. Today I thought I’d share a section of a basic list of fine motor activities that Occupational Therapy sent home for us to work on for a month to work on coordination, concentration. Please remember, these aren’t something I am taking credit for, rather something I’m sharing as I’ve seen it has been beneficial for Cutie Pie, age 6, who is having a little difficulty with writing with his left hand, although they aren’t necessarily for left handers. These are also great activities for younger children developing pre-writing skills! Pinch and pop bubble wrap – great pincer grasp work! Tearing paper for crafts – my 4 year old loves this! There are lots of ways you can make these activities more interesting if your child already does fine motor work like this often, however I think most kids just like doing these simple tasks without mixing it up. If you’d like something different because you’re bored (hey, we’ve all been there doing the same thing over and over with our kiddos), look for resources on the internet. 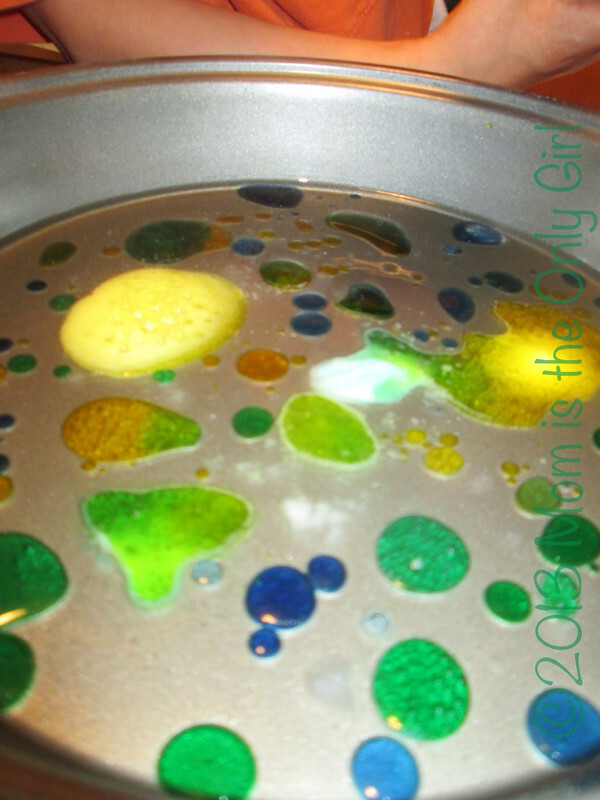 Simply look up “fine motor” and you’ll get a lot of results, make that a ton of ideas! You can also add an age in there, or a school term like preschool or early elementary to get more refined results. I will share some of the activities Cutie Pie is partial to later this week. I personally love to download different fonts for projects from the computer. There are so many different handwriting fonts that I’m seeing. This got me to thinking that everyone writes differently. I think sometimes we perceive our children learning to write through the same method, be it handwriting without tears or another means, with the end result being everyone writing the same at the same ability in the same timeframe. We know that as adults our handwriting is completely different from one another’s and also that children progress in abilities and skills at different rates. So why should children’s handwriting be the same and progress the same? While our children may not acquire skills or abilities at the same age, it is still very important for the encouragement of the development of social and academic skills to be taking place, not just from teachers, but from parents as well. Many children learn the same way. However, there are others than need to use their senses in different ways to learn the same thing. I think it is important that we, as parents, do our best to not only help our children learn what they should, but discover how it is they learn best to further the teaching at home. I will share examples (ones we use) in future posts. It is my hope that sharing this information will help you discover new (to you) ways of helping your child love to write! *Disclaimer: These ideas are not totally my own. I have been given some resources by the Occupational Therapists at my child’s school to help with his handwriting at home, unfortunately not all came with sources attached. I’m simply sharing these ideas along with my observations in hopes that by seeing how they are helping my child they can help you or encourage you to seek help if you feel it is needed for your child. Take an interest in your kids’ writing, by taking an interest in their day by way of what they choose to write about. Hubby spends more time with Cutie Pie at nighttime than I do, I admit it. Cutie Pie wants me to do shadow puppet shows against the wall with him and they just are, well, shorter than what Hubby does. I’m pretty sure it’s because my drawing skills are not good enough for him and Hubby is a great draw-er. A few years ago Cutie Pie was given this glow board and we have been drawing on it almost nightly ever since. At first it started out with us drawing pictures for him, then letters of the alphabet, then he tried his hand at drawing and writing letters. Now it’s a combination of drawing and writing done by Hubby. Let me tell you it’s been a great tool in helping Cutie Pie get better at reading! Hubby sometimes writes what Cutie Pie requests be written. It can be a nonsense word, a silly word, whatever, and Hubby will write it so Cutie Pie can make the connection. Other times Hubby will draw something and then label it, be it a silly name for a drawing of a silly man or some such thing that will inevitably make Cutie Pie squeal with laughter. Making learning fun seems to be one of the ways Cutie Pie absorbs and excels in the learning area. How do you make learning to read fun? I’d love to try other methods! I’ve posted recently about Sweet Pea learning the alphabet at preschool and how we’ve been trying to reinforce that learning at home. One thing we still do to help Cutie Pie, his 6 year old brother, in learning to read is to have things labelled around the house and to point out words when we see them in writing (like on signs at the store). I decided to take this approach with the alphabet, too, but by placing the alphabet around the inside of the house. I already point out letters when we are out and about, why wasn’t I doing it at home? Oh yeah, because they are only in certain areas of the house, not throughout it like the word labels! 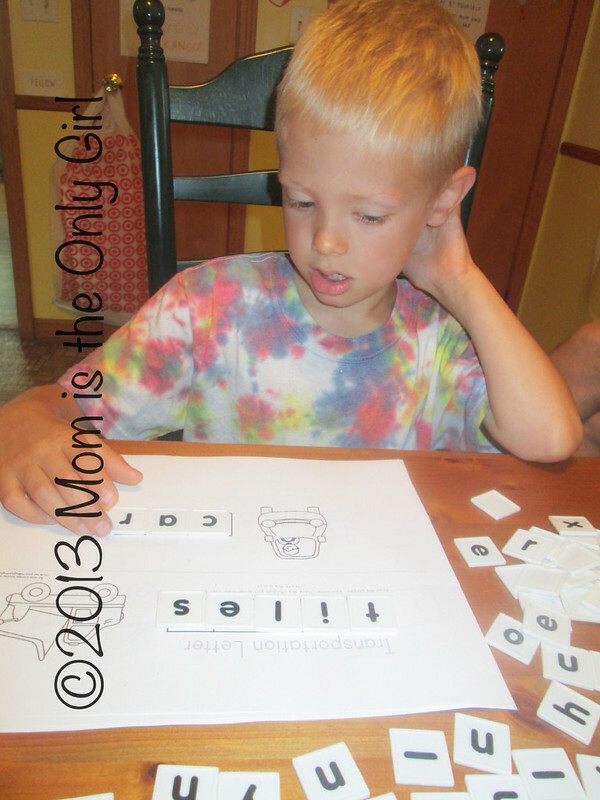 What do/did you do to help reinforce learning letters with your little ones? I’ve mentioned before that Sweet Pea (4 yrs old) is learning his letters in preschool. We’ve been working on them here at home, too, but in the form of play. Here’s one way that’s fun for him! A bonus from this activity is that we have learned a few signs that we use! Sweet Pea loves this because it’s “our secret talking tool”! In what ways are your kiddos creative? Do you have to reel them in by setting something up for them, even if it is an open-ended activity? I set out some painting materials last week to see if I could draw the boys’ interest. Cutie Pie came over almost immediately, and tried his hand at painting dinosaurs and dragons. It took a bit, but Sweet Pea joined in, too. After a few minutes I set out some painters tape. They were both curious as to why. I began placing strips of it on a new piece of card stock and encouraged them to paint it. Sweet Pea loves to mix his colors and see what shades of brown he can make and Cutie Pie found the end result cool, but was more interested in creating his dragons and dinosaurs, so I made my own little creation. Do you like the pic I made with it for the blog post? Interested in doing this with your kiddos? Simply start with a clean piece of paper, card stock or canvas. 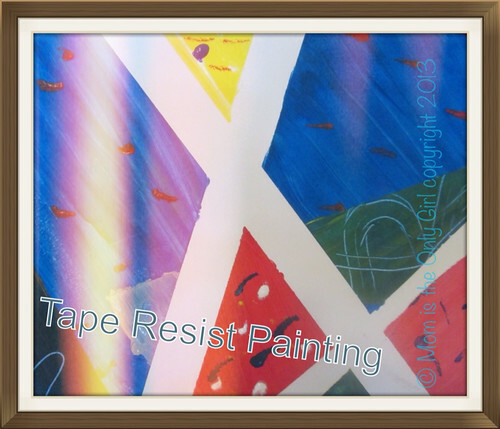 Place strips of tape as you please on your painting surface, then paint as desired. Once dry carefully remove the tape. To make something a little more interesting (for any age) you can continue to layer the tape over dry paint and repeat as many times as you like, maybe over the course of a few days. Be very careful when removing the tape using this method as the paint with be thicker and will tend to peel off a bit. You could also use this method on a large piece of paper and watch your child use their gross motor skills to cover the paper with paint! Cutie Pie asked to do this again another day and that time we painted on canvas with the tape placed right on the canvas making white lines. He added dinosaurs to the white lines using different colored crayons. My boys aren’t necessarily into making crafts, but when they find a creative activity they like they tend to ask for it again and again! What was your kiddos’ most recent creation? Sweet Pea, my 4 year old, has been learning his letters in preschool. Many times he’ll come home and write them in the air with his finger for me when I call out a letter which I know he knows. 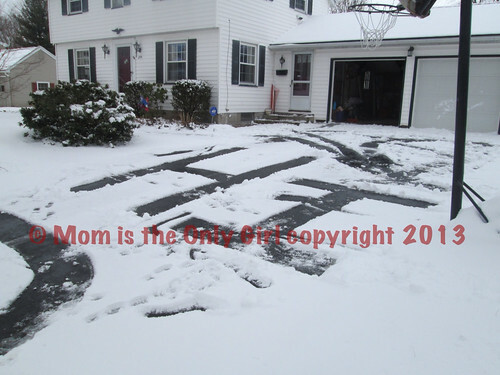 The other day we had just enough snow to cover the driveway, so while we were playing outside I decided to see if he truly recognizes his letters!